It's only natural that a man with a voice as distinctive as Jimmy Stewart's would have a good time with radio. Of course he's known as a huge movie star, but he spent more than his share of time in front of a radio microphone as well. Stewart, whose birthday we celebrate today, made frequent appearances on classic radio mainstays such as Screen Guild Theater, Lux Radio Theater, and Silver Theater. He also starred in Six Shooter from 1952-'54. Some of the productions to which Stewart lent his talents on air include "It's a Wonderful Life," "Winchester '73," and "Destry Rides Again." Later he would host a show called "Good News," a promotional venture for MGM. On this show, he'd interview MGM stars with upcoming films. 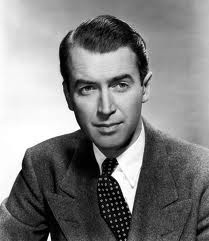 So next time the name Jimmy Stewart comes up, remember his radio career and that he wasn't just a movie star. May 2: Happy Birthday Hedda Hopper!